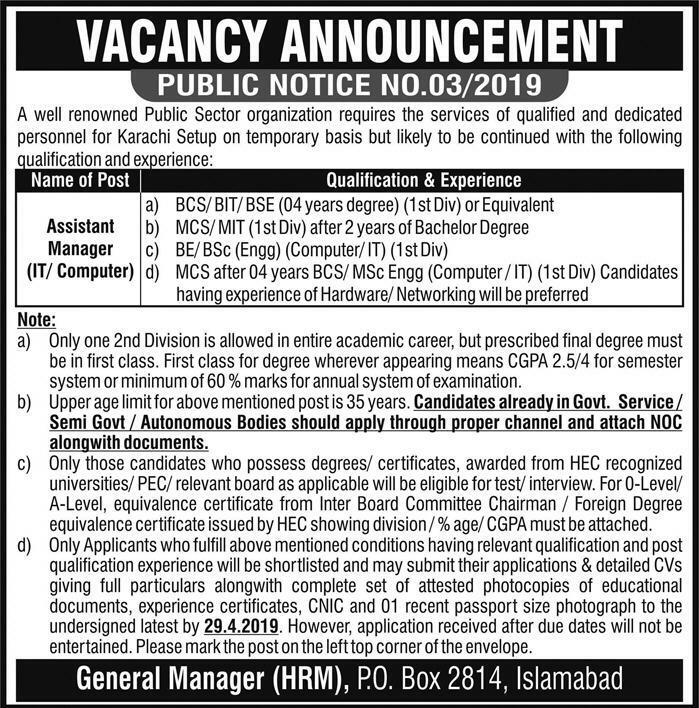 Public Sector Organization jobs 2019 are announced and 1 new vacancies are posted on 14 Apr 2019. Positions are available for the posts of Assistant Manager. Vacancies announced for the following. How to apply for Public Sector Organization jobs is given below. Please check the advertisement for more information. Job advertisement is given below. The length of the Gojra Shorkot section Motorway Project under CPEC is ______ Kilometers ? ______ is considered the “father of psychoanalysis” ? Thirty-six nations have signed an open letter criticizing ______ nation’s human rights record ? Indo-Bangladesh joint military exercise ‘Sampriti-2019’ in March 2019 was concluded in _______ locations ? ______ country has recently introduced its new currency ‘RTGS dollar’ ? Land of hospitality is ________ ? ______ is the Current Foreign Minister of Germany ?